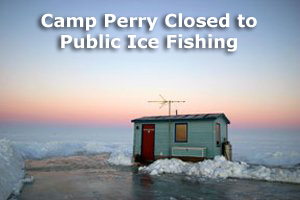 Port Clinton, OH — Due to facility damage incurred as a result of excessive use during the 2014-15 ice fishing season, Camp Perry officials have determined it necessary to prohibit public use of the area for ice fishing from this date forward. Should conditions become feasible for ice fishing, parking access will be granted to guests staying overnight in a Camp Perry Lodging facility ONLY. Parking in designated areas will be authorized by display of facility-issued parking permits only. All others will be towed at the owner's expense.